which began on October 4, was the bank’s way of celebrating the Grand Opening of its Shrewsbury branch while offering support to Shrewsbury organizations. The Bank hosted a wrap-up event with the organizations on Wednesday, November 15 to announce the results. UniBank’s Community Giving program has encouraged customers and the general public to come vote from a selection of eight community organizations that were identified by UniBank. In total $13,000 was pledged to the Shrewsbury community as part of the program. Almost 1,000 votes were tallied in support of the eight community organizations. The program promised significant cash donations to the top three organizations receiving the most votes. First place was pledged $5,000, second place was pledged $2,500, and third place was pledged $1,000. All organizations that did not receive first, second or third place donations were all pledged $500. In an exciting turn of events, two organizations were tied for second place. 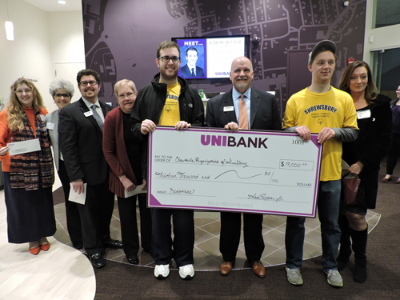 As a result, the bank gave both organizations the second place prize of $2,500. Organizations receiving $500: Special Olympics, Shrewsbury Youth and Family Services, Lake Quinsigamond Commission, and the Thom Worcester Area Early Intervention.